Today, the High Representative of the Kurdistan Regional Government in Italy and to the Holy See, Mrs. Rezan Kader accompanied the President of the Council of Ministers of the Kurdistan Regional Government, H.E. Nechirvan Barzani and his delegation to the Presidency of the Council of Ministers. The delegation was composed of the Deputy Prime Minister Dr. Qubad Talabani, the Minister of Religious Affairs, Min. Kamal Muslim, by the Head of the Department of Foreign Relations, Min. Falah Mustafa, the Spokesman of the Prime Minister, Dr. Safeen Dizayee. To welcome the Prime Minister and his delegation the Prime Minister Dr. Matteo Renzi, accompanied by the Diplomatic Advisor Amb. Armando Varricchio, the military advisor General Carlo Magrassi and other collaborators. 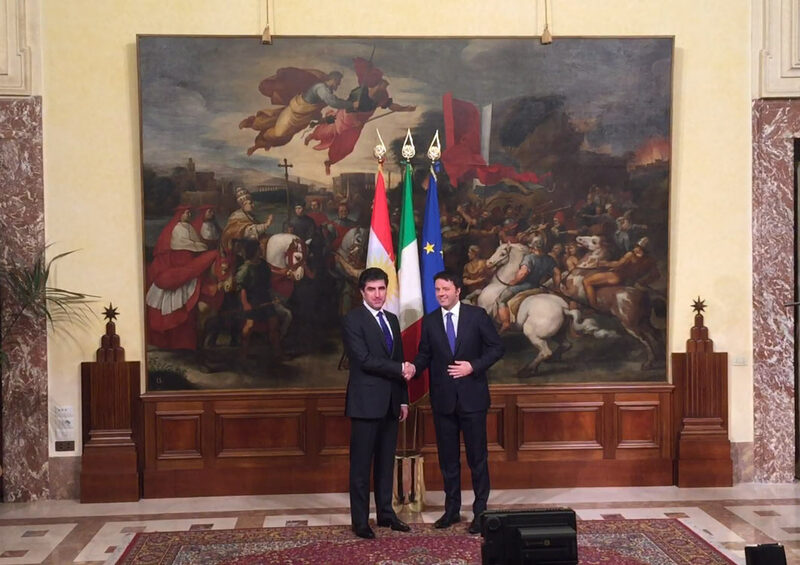 Prime Minister Barzani has expressed gratitude to the Italian Government by people and government of the Kurdistan Region for the provision of the essential humanitarian and military assistance and for the last summer visit of the Italian Prime Minister in Erbil, allowing immediate support in order to face the serious terrorist threat. The Premier informed the Italian Prime Minister on the latest developments in the Kurdistan region and the continued progress marked by peshmerga forces on the front line against the Islamic terrorist organization, ISIS. He also highlighted the situation of displaced people from the rest of Iraq and of Syrian refugees who are a heavy burden for the Kurdistan Regional Government, emphasizing that are in desperate need of additional assistance. Italian Prime Minister Renzi reiterated that his government "will continue to provide humanitarian and military assistance to the Kurdistan Region, and, in order to eradicate terrorism, it will stand next to the Kurdistan Region in every way possible." He also expressed his great respect for the courage of the Peshmerga forces in their fight against terrorism. President Renzi expressed his concern about the spread of terrorist organizations in other parts of the world, emphasizing the need to tackle terrorism together;He added that Italy will support the Kurdistan region, because it has a strategic location, and because Italy is a close friend of the Kurdish people. Prime Minister Renzi said that Italy has decided to turn its diplomatic representation in Erbil to a Consulate General, in order to send a message to the world that the situation in the Kurdistan region is better than before. He said: "It 's important for us that the region of Kurdistan continues to be stable." Both sides also discussed the relationship between Erbil and Baghdad, the situation in Mosul, the political developments in Iraq and the importance of including all components of Iraqi society in the government. They also discussed the situation in Syria and its repercussions on the situation in Iraq and the entire region. The two sides also reiterated that a political solution is needed to the Syrian crisis.